As the mom of a toddler with another child due any day now, lately I’ve been very much focused on living in the moment, knowing that life is going to change pretty dramatically in the not-too-distant future. Maybe it’s all the yoga I’m doing or maybe it’s because every day I look at my 3-year-old and think, “where did my baby go and when did she become a kid?” I also think as a working mom, I want to soak up as much time as I can with my child, since the chunks of time in which our schedules overlap is somewhat limited. Between shuttling kids to and from school or activities and sleeping, the time most working parents spend with their kids is spent eating (namely breakfast and dinner) and, if you’re lucky, a little bit of playing. Why congregate in front of the TV after dinner when there’s so many better ways to interact with your kiddos? It’s best to maximize this time and use it to set good examples. Whether we believe it or not, our children look to their parents as role models, and we’re the ones who help guide their behavior. 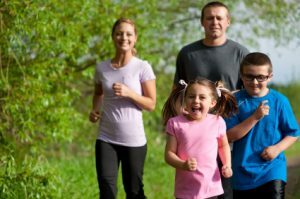 They follow and mimic our attitudes and approach to food and exercise, so if you want your child to be healthy and active, you literally have to walk the walk. With the weather much more pleasant and the birds practically begging people to join them outside, now is a great time to peel yourselves away from the screen (computer, TV or smartphone – no matter) and engage in some outdoor fun with your kids. Also, May is National Physical Fitness and Sports Month, so what better excuse could there be? Head to a local park and play WITH your kids. Don’t just sit yourself on a bench and swat mosquitoes, but push your child on a swing, lift her up on the monkey bars, or kick a ball with her. Sure, most young kids will happily trot off and run around on their own, but what example are you setting if you just watch them while they play? That when they grow up they get to sit around, too? Have a nightly post-dinner stroll as a family. We do this as the days get longer, and it’s a great way to get some fresh air, work off the nighttime meal, and take the dog for a walk. Also, as kids get older sometimes the best conversations are had when parent and child are both looking ahead and not at each other, like you would at the dinner table. It’s great bonding time, AND a little bit of exercise. Explore. Pick a weekend day and find a local trail to hike or ride bikes. Try something new every time you go out. As a runner, it never bothered me to hear “on your left” and see a family (all wearing helmets) passing by in single file. Do chores together. Yes, these count as exercise but it’s cheating if you just send your kid off with the promise of a payday once the job is done (by the way, I’m not against paying kids to do active chores, but I am if it means the parent gets to sit in the hammock!) Wash the cars, mow the lawn, rake leaves – do it together and it’ll get done faster. The National Institutes of Health’s We Can! Program (Ways to Enhance Children’s Activity & Nutrition) has a bunch of resources to help families be active and eat healthy. For tip sheets and more information, click here.